What's a Woman Doing Here, Anyway? In her brilliant debut novel, longtime daily journalist Theasa Tuohy captures the essence of what drives those who go into war armed only with a camera, notebook, and pen. At a time when women rarely dreamed beyond careers as nurses, teachers or secretaries and certainly not as news reporters, a tall, enigmatic redhead arrives in Saigon. She is an object of great interest to the male correspondents, one of whom reports she arrived at Tan Son Nhut Airport wearing “high heeled bikini shoes.” Few take her seriously as a reporter. To most, she is a trifle, a bobble, a lagniappe. Angela Martinelli survives a chopper crash, spends several days in the bunkers of the so-called Alamo Hilton during the siege of Khe Sanh, is captured briefly by the Viet Cong while trying to make her own way to the battle of Hue after being refused a hop on a military chopper because she isn’t male, and finally is badly wounded when a jeepload of other correspondents are killed in Cholon, the Chinese quarter of Saigon. Her life, loves and struggle to prove herself chronicle the deterioration of the war, the strategic battles around the Tet offensive, and the conflict raging back home over the conduct of the war. Not since Graham Greene has anyone captured so well the tedium and terror of reporting on war. Theasa Tuohy has worked for five daily newspapers and the Associated Press. She is co-book author of Scandalous: The Musical, an award winning show about the life of DH Lawrence, and has written a memoir about renovating her home in France. She is currently working on a mystery set in Paris. She lives in Manhattan. 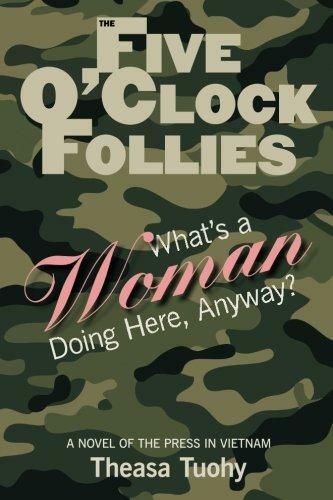 To what does the title refer: The Five O’Clock Follies? What does this name coined by the war correspondents suggest about their perceptions of the military bureaucracy? As you progress through the novel, do you feel the name to be appropriate? What first impression does Angela make on Nick O’Brien and Bo Parks when she steps off the plane in Saigon? What impression does she make at the first military briefing? What problems face an unknown free- lancer in a war zone? What problems face an attractive woman beginning a freelancing career in a war zone? Is gender bias currently a problem in the United States? With help, Angela evolves as a war correspondent. How do opportunity and acceptance happen for her? How is Nick instrumental in her success? How does her story-seeking nature contribute? Some characters seriously influence Angela’s opportunities and perceptions as she begins her career as a correspondent in Saigon. How and why do some characters go out of their way to help her? Consider Bo Parks, Mac Wheeler, John Simenson, George, the Medevac pilot. Does Ford Curtis fit into this category as a “helper”? Why or why not? Angela observes late in the novel that Nick “lacks emotional participation.” Do you agree? Do you receive some insights about why this may be true of him? How does this “flaw” manifest itself? Do you see Nick growing emotionally as the novel progresses? What does his behavior after Cholon suggest about Nick? What does his acceptance of Curtis as her romantic choice suggest about him? Explain the trauma Angela experiences during the Medevac expedition and at Khe Sanh. How does Nick’s sensitivity bring Angela and him closer emotionally? Explain. They had begun to trust each other early in the novel and actually admitted to being “best friends” previously. What events with the “White Mice” and Tet offensive led to this trust and friendship? Angela seems conflicted about love. How might her childhood have triggered this? Describe the dilemma she feels, the needs that she has. How has her life seemed to reflect this confusion? Consider Jackson’s challenge… “another river to cross”… Peter as a safety net that failed. How does the phrase that pops up repeatedly…a green kitchen… epitomize her fears? How does her father help her deal with her insecurities, to see her mother in another light as she recovers from her Cholon injuries? This conflict seems to confuse her feelings for Ford Curtis. Why is she afraid of him? Why is she so attracted to him? What leads to the emotional blow ups they have, one in Curtis’ home in front of guests, the other in the hotel among other correspondents. Are her physical attraction and her feelings when she’s with him sufficient reasons for a long-term commitment? What future do you foresee for Angela if she marries Curtis and returns to the States? Is it possible that she and Nick might have a future? What is the symbolism of the bird cage? Angela has a need to prove herself. How do her war zone decisions and forays reflect this need? Consider Hue. Was this a wise choice? Was it a successful choice? Why? What motives does the military brass ascribe to her experiences as a prisoner of the Cong and her politically charged stories? What other danger does she seek out in order to find “enterprise” stories? Consider her Medevac foray and Khe Sanh. Also she challenges authority with her observations about the Chinook’s mechanical failure. Explain. A conflict that crops up repeatedly in the novel is the military’s and the public’s view of reporters, their motives, their competitiveness. Angela voices their importance when she states: “Reporters can freeze the event, lift it up for a moment and put it on stage…we represent society’s support and sympathy. Our very presence means this is horrendous, we’re going to record it for all time, put it in the newspaper.” Can you agree? Why or why not? The bureaucracy would like the press to subscribe to the “official” line. What discrepancy in official information almost kills Angela and Curtis? How does withholding important information contribute to tragedy in the novel? Why have the wars in Vietnam, Iraq, and Afghanistan been divisive for our country? Has public acceptance of Vietnam changed over time? Explain. Compare the public view of these later wars with World War II.